What does it say about a relationship with a crucial ally when you're unsure about the safety of its nuclear arsenal, worry about the stability of its leader, suspect the intentions of its powerful military leadership, and even cast doubts about your own, covert drones program in its territory? Those are the questions that are glaringly raised by the latest tranche of State Department cables regarding Pakistan released by the WikiLeaks website and published by a number of media outlets. Despite breathless denials of a threat to Pakistan's nuclear stockpile from both Washington and Islamabad, the leaked cables reveal that both American and British diplomats expressed fears that Pakistan's fissile material could slip into the hands of Islamist extremists, or even precipitate a forbidding nuclear exchange with arch-rival India. As far back as December 2008, a National Intelligence Estimate noted that despite the "pending economic catastrophe, Pakistan is producing nuclear weapons at a faster rate that any other country in the world." It was a development at cross purposes with Washington's longstanding but increasingly forlorn attempts to wean Pakistan away from its strategic obsession with India. In September 2009, Mariot Leslie, a senior British diplomat, told her U.S. colleagues: "The U.K. has deep concerns about the safe and security of Pakistan's nuclear weapons," according to a cable that was classified at the highest level. Pakistan developed its nuclear program in rivalry with India's, whom Pakistan's military leadership, and perhaps others, continue to perceive as the nation's chief threat, as the cables reiterate. Fears over Pakistan's nuclear security were also voiced by then U.S. Ambassador Anne Patterson, who left her post in Islamabad this year, in a cable dated February 2009. While lauding Pakistan's transition to democracy after the resignation of General Pervez Musharraf, and underscoring the fact that it is not "a failed state," but still one where "the militants" are driving the agenda, Patterson wrote: "Our major concern is not having an Islamic militant steal an entire weapon but rather the chance someone working in [Government of Pakistan] facilities could gradually smuggle enough material out to eventually make a weapon." The cables sharply contrast with the public declarations of both Pakistani and American officials in the past few years. "All this propaganda of our assets falling into wrong hands has no relevance at all," Shah Mehmood Qureshi, Pakistan's Foreign Minister, told a Russian TV channel, four months after Patterson's cable was dispatched. President Barack Obama sounded equally sanguine just this year. 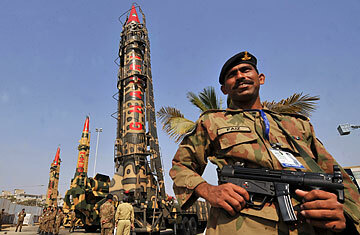 "I feel confident that Pakistan has secured its nuclear weapons," the President told the New York Times in April 2010. The cable dump came in tandem with revelations, confirmed by the Pakistani government, that the U.S. had been seeking to empty enriched uranium from a Pakistani research reactor. In an eyebrow-raising briefing with Pakistani journalists on Monday, very likely timed to coincide with the anticipated leaks, a senior military official averred that the "people of Pakistan" fear that the U.S. wishes to "denuclearize" the country and maintain both a level of "controlled chaos" and a merely "transactional relationship"  a term that was coined by Joe Biden, in November 2007, when he urged the U.S. to be more engaged with civilians. Instead, Pakistan has become America's "most bullied ally," the senior military official claimed. Those concerns are reflected in the cables: "The Pakistanis worry that the U.S. will 'drop in and take their nukes,'" British diplomat Leslie said. For a U.S. administration moving toward a settlement in Afghanistan and having lavished vast sums to secure Islamabad's support, it does not augur well that this is what the generals in Pakistan are thinking. And, as the cables make plain, it is they who remain very much in control of the country. When an opposition demonstration took to the streets to seek the reinstatement of the sacked chief justice in March 2009, there were fears of a political crisis that could unseat the government. American and British diplomats rushed around, seeking to defuse tensions. In a meeting between Pakistan army chief Gen. Ashfaq Kayani and Ambassador Patterson that week, Kayani floated the idea of what could be seen as a soft, backstage coup. In a cable, Patterson wrote that Kayani "hinted that he might, however reluctantly, have to persuade President Zardari to resign if the situation sharply deteriorates." The army was even less keen on opposition leader Nawaz Sharif taking power. As widely suspected at the time, the current military leadership retained a political agenda very much at odds with the professional soldiery image it has sedulously cultivated over the past three years. Zardari himself appears to fear that the military will remove him from power, if not altogether. According to one cable, he told Vice President Joe Biden that he worried that the army might "take me out." (It is unclear whether he meant a threat to his life.) The Pakistani president has been known to predict his own assassination, sometimes publicly suggesting that his corpse will leave the presidential palace in an ambulance. From the cables, it appears that he has actually made elaborate preparations in the event he meets the same fate as his slain wife, former Prime Minister Benazir Bhutto. According to the cables, Zardari has apparently instructed his son, Bilawal Bhutto Zardari, to appoint his sister, Faryal Talpur, a major political player in the ruling Pakistan People's Party, as president. This year, Zardari asked the UAE government to allow his family to live there if he was killed. Though Washington clearly has its doubts about Zardari's abilities, it sees him as essentially on its side. "While far from perfect, you will find Zardari is pro-American and anti-extremist," a February 2009 cable read. "We believe he is our best ally in the government." It evidently harbors greater doubts about the partner that truly matters when it comes to battling militancy and settling the fate of Afghanistan: the army. As one February 2009 cable read: "[We] need to lay down a clear marker that Pakistan's Army/ISI must stop overt or tacit support for militant proxies (Haqqani network, Commander Nazir, Lashkar-e-Taiba)." Nevertheless, the cables reveal a hitherto unknown level of close cooperation between the U.S. and the Pakistan army, with 16 U.S. special forces troops deployed in late 2009 in the tribal areas, to help hunt down militants and coordinate drone strikes. The intensified drone program has killed half of al-Qaeda's top leadership, Ambassador Patterson pointed out in September 2009. Still, she writes in a sobering admission, the airstrike campaign is risky, with the potential of "destabilizing the Pakistani state, alienating both the civilian government and military leadership, and provoking a broader governance crisis without finally achieving the goal." At the heart of the relationship with the Pakistan army is money. Kayani does not want his troops to be seen a "force for hire," but the foreign funds appear crucial to its operations. As a February 2009 cable notes, the Pakistani economy "remains too weak to support the Pakistani military's appetite for expensive weapons systems." Over $7.5bn in coalition support funds have been lavished on Pakistani troops. But hundreds of millions of dollars earmarked for battling militancy has been diverted into the government's accounts, the cables claim. Other claims are said to have been inflated, such one of $70 million for radar maintenance, despite the militants having no air attack capability, and another $26 million claim for barbed wire. Still, the U.S. evidently feels a need to keep the money flowing: "The relationship is one of co-dependency we grudgingly admit," a February 2009 embassy cable says. "Pakistan knows the U.S. cannot afford to walk away; the U.S. knows Pakistan cannot survive without our support." And yet the U.S. seems to know that money won't be enough to persuade Pakistan to cease its alleged support for militant groups that operate in Afghanistan and India. "There is no chance that Pakistan will view enhanced assistance levels in any field as sufficient compensation for abandoning support to these groups, which it sees as an important part of its national security apparatus against India," Ambassador Patterson warned. She must have been relieved upon leaving Islamabad. As the cables demonstrate, scarcely could the job have been more difficult  and at a time when the stakes are so high.